Expansive soil shows volume changes upon change in moisture content in soil and movement is found to dominate in vertical direction. Plastic cohesive soils like CH are most susceptible to suffer volume change which is enriched with montmorillonite. Lean clays like CL can also result structure damage when moisture content in soil is sufficiently large. These types of soils swell during wet season and shrink during dry seasons. 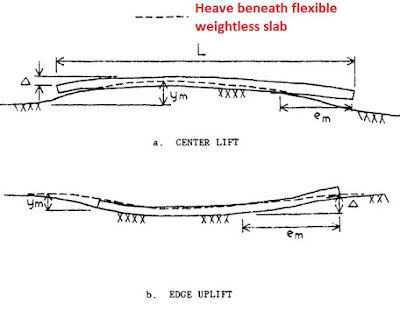 In this type of movement raft foundation is deformed upward at center relative to edge. This is due to increase in water content of soil and heave at center relative to foundation perimeter or reduction in moisture content and subsequent shrinkage near perimeter as compared to center. When foundation is constructed on ground surface, it prevents evaporation from ground surface; thus eliminate moisture loss due to transpiration from existing vegetation. The moisture content of soil, therefore, is increased, especially at center of mat foundation. At the central portion of soil under mat, environmental variations have least effect. Soil outside or near perimeter have tendency to dry out during dry season which results settlement at edge relative to center. 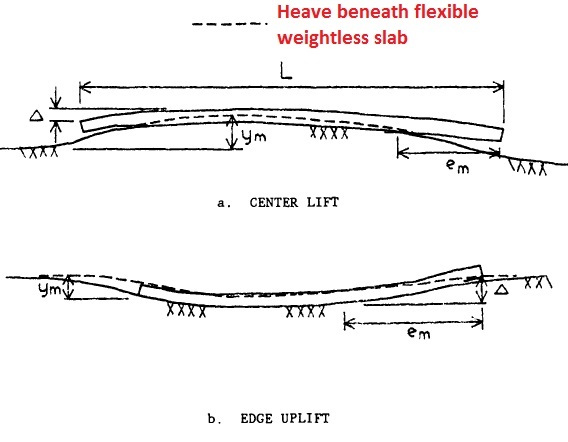 When movement is center lift, the mat is treated as cantilever supported at center as shown in following figure [Fig 1(a)]. Two input parameters ym and em are required for design of mat foundation. ym = Maximum soil heave at surface relative to edge of foundation when foundation is not loaded. em = Maximum distance from edge of foundation up to which moisture may vary. The maximum value of deflection Δ, shear stress, V and bending moment M can be determined when analysis is performed. ym depends on soil type and change in water content within depth of active zone of heave, Za. em is the lateral distance from perimeter to interior where seasonal variation of moisture can lift mat from soil surface. In this case edges of mat foundation deflect upward relative to center of mat due to increase in moisture content of soil. Here either heave occurs near perimeter of foundation or soil at center shrink due to due to reduction of water content. In arid or semi-arid regions irrigation during dry season or seasonal rainfall generally result edge lift. When foundation soil at center dries out due to flow out of moisture from interior heated areas, edge lift may also be occur. In design purpose, we assume raft foundation is supported at its edge and at portion located somewhat interior from edge. The parameter ym and em helps us to determine the span length.Raft deflects download at center under interior loads and make a contact point or more accurate contact perimeter with soil.So foundation load is also a parameter to determine span length. Thus the raft is designed as simply supported member (beam) having support at edge and at that contact point lies somewhat interior location from edge. Above figure illustrates that fact clearly.